There’s a handful of players on this Top 100 list who made it based on what I saw, on the ice and off it, as opposed to the raw numbers they amassed during their time with the Edmonton Oilers. Adam Graves, who played a key role in Edmonton’s fifth Stanley Cup win in 1990 as a member of the Kid Line, is one of those players. 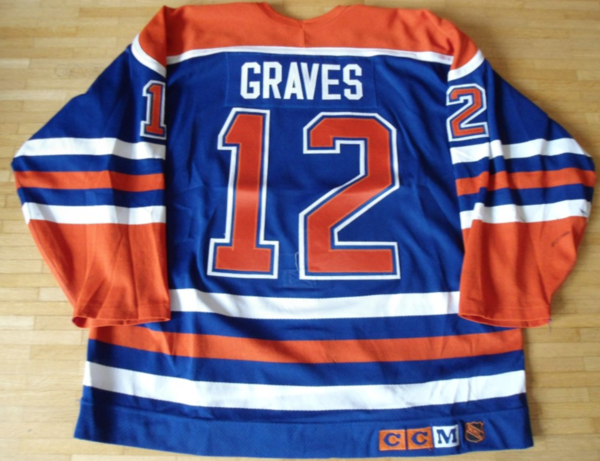 Graves was one of those throwback guys, a glue guy, during his too-brief tenure with the Oilers. He was that rare mixture of skill, toughness and willingness to do whatever it took to win that doesn’t come along very often. We got just a glimpse of Graves in the 139 regular season and 40 playoff games he spent here before he went on to bigger and better things in Manhattan. Graves hadn’t yet blossomed into the talent he became during the 772 games he’d go on to play with the New York Rangers — he had his jersey No. 9 retired in New York and in a book about the top 100 Ranger greats of all-time he was named No. 13 – but we got some glimpses of what he’d become, especially during that 1990 Cup run alongside Joe Murphy and Martin Gelinas. Graves arrived in Edmonton to much fanfare, acquired from the Detroit Red Wings along with Petr Klima, Murphy and Jeff Sharples in a trade that sent discontent Jimmy Carson, Kevin McClelland and a fifth-round draft pick to the Motor City. GM Glen Sather wasn’t wearing a balaclava when he orchestrated the deal, but he should have as Graves, Klima and Murphy all played significant roles in that 1990 Cup win. Coming off a regular season in which he had just 21 points in 63 games with the Oilers, Graves had 11 points in 22 playoff games, including a game-winning goal against Los Angeles in the second round. Murphy had 14 points and Gelinas five points as the trio provided much-needed depth of scoring behind Mark Messier, Craig Simpson, Jari Kurri, Esa Tikkanen and Glenn Anderson. Simply put, Graves thrived outside the spotlight in Edmonton in a support role to Messier, Kurri and Simpson as Edmonton’s 1980s Dynasty Days wound down before taking over centre stage when he later landed in New York. “It was such an excellent team atmosphere,” Graves said. “We were together as any group of guys in the league. Had Graves not left the fading Oilers for New York as a free agent in September of 1991 and spent another three seasons here – he scored 26, 36 and 52 goals in that span — he’d likely be a top-20 guy on this list. Graves was hard-nosed, talented and he always put team first in the room and on the ice. What a beauty Gravy was. I’m a big fan of Graves. But looking back now, he really wasn’t an Oiler long. Too bad the organization had no money back then. The guy only scored 16 total goals in Oilers silks, which is insane to think about. I remember that Slats said he would be Captain after Messier…well that is until Pocklington decided to sell everyone to New York. When graves signed with the NYR an arbitrator gave the Oil Troy Mallette in return. Probably the most lop sided arbitration ward ever. It was one thing to not be able to afford the All stars, it was another to not be able to afford to keep an up and coming young player due to salary. Those were some very dark days for Oiler fans. My dad took me to games when it was still Northlands. By 2nd intermission he’d give me $5 to go buy some cards and one time he was flipping through them. This was 1994 and he came across an Adam Graves card and he just shook his head. He sees Graves scored 26 goals and then 36 and that year he was on pace for over 50. He just aghast the Oilers could’ve let a guy like him slide past for next to nothing. Often wondered sometimes how much money playing up the “we are a small market team” cost the Oilers back then. Imagine if they found the $20 it would’ve taken to keep Graves. What does that production do for this team? How many playoff games does that net you?